A vivid exploration of the audacious, generally unauthorised, stealth attacks of Australian infantrymen on the German front line of 1918. In 1918 a few daring low ranking Australian infantrymen, alone among all the armies on the Western Front, initiated stealth raids without orders. 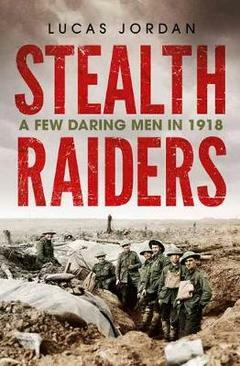 Stealth Raiders: A Few Daring Men of the Australian Infantry 1918 examines this distinct but neglected group. Stealth raiders killed Germans, captured prisoners and advanced the line, sometimes by thousands of yards, and almost always without command on either side knowing. They were held in high regard by other men of the lower ranks and feared by the Germans facing them. Since Charles Bean laid down his pen in 1942, historians have not considered the distinctive character and motivation of these men. Who were these stealth raiders and why did they do it? How significant were their actions and what made the Australian so distinctive in this independent and personal type of warfare? Using their first-hand accounts, official archives and private records Lucas Jordan pieces their stories together. The book considers the stealth raiders’ war experience and training, the unprecedented topographic and environmental conditions at the front, and the quality and morale of the German Army in 1918. It also goes beyond these to consider the influence of Australian civil society and in particular the “bush ethos”. It demonstrates that bush skills gave some stealth raiders an edge and that the bush ethos, with its high premium on resourcefulness and initiative, contributed to making stealth raids a distinctively Australian phenomenon. Lucas completed a Bachelor of Education at the University of Queensland followed by a Masters in Aboriginal Studies at the University of Notre Dame. This led to more than a decade of teaching and research in the Kimberley, Cape York and central Australia, and ingrained in him a deep respect for the Australian bush and its people. Lucas worked for Amnesty International as a researcher and fieldworker and co-wrote Amnesty’s global report '"The land holds us": Aboriginal peoples' right to their traditional homelands in the Northern Territory', which was based on three years of collaboration and camping with the Alyawarr and Anmatyerr people of the Northern Territory.